Friend ‘David’ sent many photos (and even a movie!) of his Pastime Projects audio amplifiers in use.� That’s a regenerative receiver operating in the upper right of the photo. I think that is an antenna tuner on the upper left.� The movie he sent illustrates lots of volume and great audio. 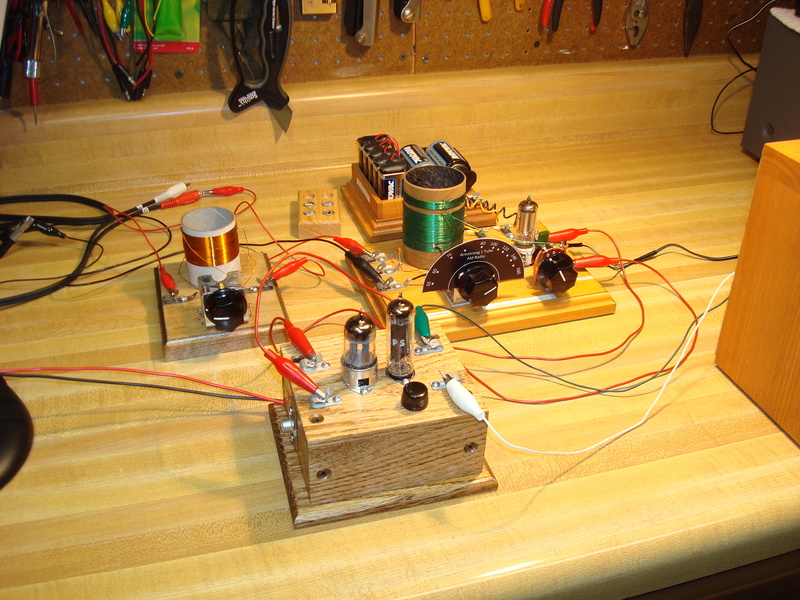 David bought, built, and operates both the�vacuum tube and the solid state versions. He promises more info later. Thanks David! Lots going on here. The next run of “Mini-Woofen” (12 volt vacuum tube amplifiers) is underway.� All parts are being placed in stock,� yesterday a new lot of instruction manuals were printed, and all of the 12U7 vacuum tubes received were checked on our tube tester.� These are advertised on our web site as well . The newsletter went out on schedule. We may publish another before end of December.� We have a new dummy load�kit �in production for small transmitters.� Not advertised just yet. It will handle 8 watts max and has a fed-thru cap for monitoring.��The 6V6 6L6 tubes from China were evaluated here.� We now stock one that proved the best results, not on the tube tester, but based on output of the transmitter.� All of� the new tubes are ready to ship. Great deal at $10.00 each. You are currently browsing the R3tr0rad's Blog blog archives for December, 2010.